We traveled to England to rediscover and expand our knowledge of the rich historical legacy passed down through the ages. History bequeathed us hints, tracks, and traces in the land emerging from the Neolithic era, as the ice age sheet melted away, and early humans hunted to extinction the woolly mammoth and aurochs. 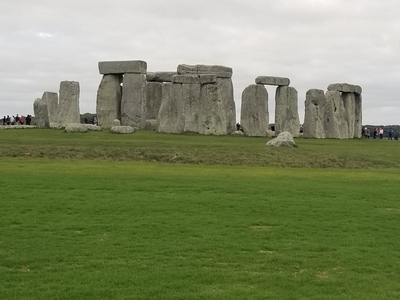 No one can travel to England without being in awe of human technology leaps in the late Neolithic period to witness the construction of the mysterious Stonehenge, and numerous other henges throughout the country. The Bronze and Iron Ages brought to light the emerging sophistication of tools, agriculture, and art. Multiple invasions from the Continent ushered in diversity of language, culture, and the intermixing of civilization through intratribal warfare. At the latter half of the post-Classical period, the Roman invasion introduced shocking societal changes that divulged the high art and lifestyle of amazing aesthetic building, mosaic tile designs, writing, detailed jewelry, statuary, heated rooms and baths, and road construction that contributed to advancing enlightenment. 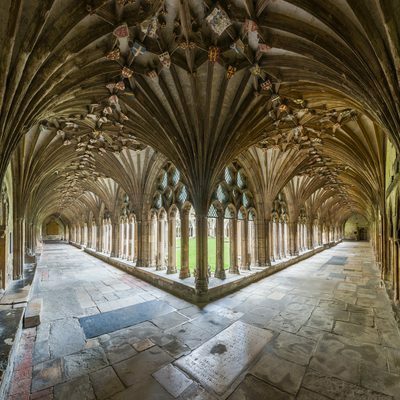 The disintegration of the Roman Empire and the resultant collapse of bureaucratic infrastructure left England to cloister and consolidate knowledge in scattered monasteries. It would eventually reemerge amidst a revolution of language amalgamation between the preexisting Celtic and the newly invading Germanic tribes—Saxons, Angles, and Jutes. 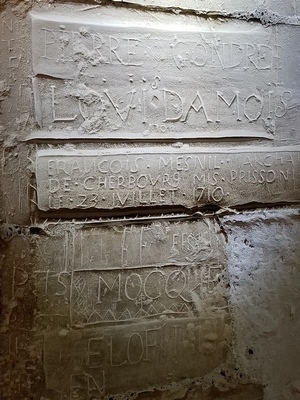 Later, beginning in 1066, French entered into the picture through the Norman Conquest; and we must not forget the official language of the church, Latin. Ruth and I eagerly immersed ourselves in art, architecture, science, religion, language, development of community, government, information storage, farming, aestheticism, medicine, and intriguing arcane sublayers of civilization. Our intent during our travels was not to rewrite a history book, but to immerse ourselves in the serendipity of revelation in time and place. This was to be an exercise in sensual awakening, as it’s pretty difficult to travel anywhere in this country without realizing how many layers of this onion there really are. Hidden gems are scattered infinitely across the landscape, and one only has to stop for a moment, have a conversation, wander into the weeds, pop into a pub, immerse oneself in museums large and small until your head and body aches with information overload, navigate on ferries, drive on the country’s ancient enigmatic road system, walk along major metropolitan and tiny hamlet streets, and be willing to never stop asking who, what, when, where, why, to travel forward and back in time. The first stage in our entry into the country was coming to terms with the road systems: the most obvious challenge being that everyone drives on the left side of the road. This originated in the feudal period, when the (mostly) right-handed people needed to keep their sword arm free for protection and scabbard protected from enemies. Apparently if you were left-handed, you were just out of luck. In major cities in the UK, many pedestrian crossings are marked with “Look Right” and “Look Left,” appropriately placed to assist confused foreigners. It takes some time to retrain brain functions both arriving in country and returning to the US as a walker and driver, to avoid the inevitable consequences. Roundabouts are an elegant solution to traffic control that the US is just beginning to adopt. If you miss your designated street in the circle, just continue on for another go, no stops necessary. Ruth and I embraced our own system of using the hours of a clock to prepare for our exit in fast moving traffic such as an 11 o’clock or 3 o’clock departure, though our GPS would say “first” or “third”exit. Unlike America’s thoroughfares, which are primarily based on New World urban planning, the road system in the UK has its roots in antiquity. Human, horse, and cattle and sheep passageways through the natural landscape created non-linear streets that rarely allow for the passage of two vehicles passing abreast. M Roads, the widest in England, are equivalent to our large highways and interstates, but once you exit, there is no room for daydreaming. 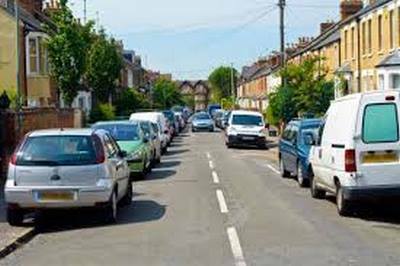 In narrow, winding streets drivers need to carefully avoid clipping stationary mirrors of cars parked on the left and fast-moving vehicles on the right. In a previous blog post, I posited that England is a civilized country. I will add to this, an orderly one as well. Everyone knows their place, order is maintained, and systems only flow seamlessly when everyone follows the rules. When two vehicles come to a transition from two lanes to one, the first to arrive gets the right of way. If both arrive simultaneously, one driver flashes their lights to give way. As a US driver, it took me some time to come to terms with the reason I would always be tailgated. 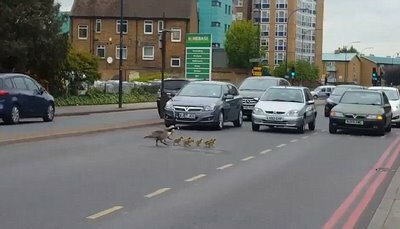 It soon became clear that the lead car in a pack would assume the role of the leader goose in a flock. When a leader driver comes to a clear spot on a two-way road that changes to a single lane, everyone behind uses their leader’s sight lines to follow through. 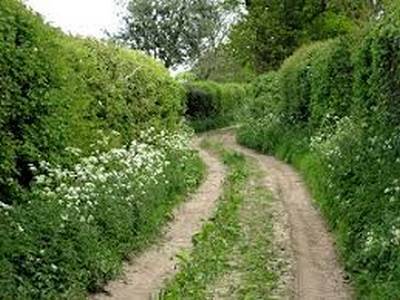 Hedgerows, often six to eight feet high, are commonly found on most upcountry roads making visibility around corners impossible. Having said that Romans built straight roads, in the twenty-first century, GPS struggles with the complexity of tiny hedgerowed country lanes and the mind-boggling complexity of London’s maze of streets. Black cab taxi drivers in London are a special breed, miles away from your typical stogie-chewing New York gabby-cabbie. In order to obtain their license, all London taxi drivers are required to pass a world-renowned test of navigation known as “The Knowledge.” This stringent exam includes becoming a master of at least 320 basic routes and all of the 25,000 streets connected to those routes, as well as 20,000 landmarks contained just within the district of Charing Cross alone. On average it takes between two and four years to reach this level of proficiency. Driver candidates have access to study the “BlueBook,” through which they can download sections to take out on moped rides through each section to reinforce memory and proceed to the next segment. Here is a short video listening in on a London cabbie’s thoughts about The Knowledge. While driving along the M25, a 50-mile ring road around London one day, we noticed that oncoming traffic on our right had ceased. This seemed very peculiar considering the importance of this route. About a mile on, the source of this interruption became amusingly clear. Three men had jumped out of their truck and were attempting to shepherd a cranky, obstinate goose off the road with little success. The traffic jam behind them stretched patiently for several miles. Ruth reminds me that order is so ingrained in British society that a person arriving at a bus stop, and being the only person there, just naturally becomes an orderly queue of one. 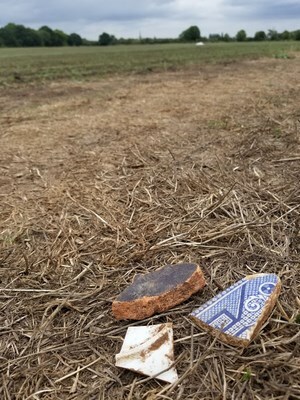 and dishware blending in with the shorn stalks of the season’s crops, and we visited numerous Roman villas discovered by sharp-eyed farmers and utility-trench diggers. 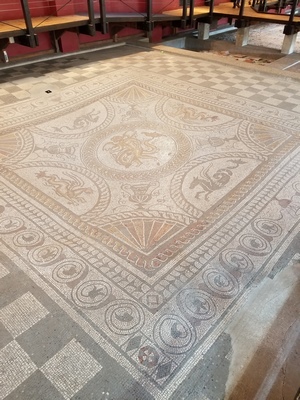 One such site contained stunningly detailed Roman mosaics approximately 20 feet wide and long, covering a floor of a once very rich Roman merchant, around 200 CE. Archaeology reveals that London has its roots in the mists of time. Artifacts have been dug up throughout the city, and from the muddy shallows of the River Thames, establishing this provenance. 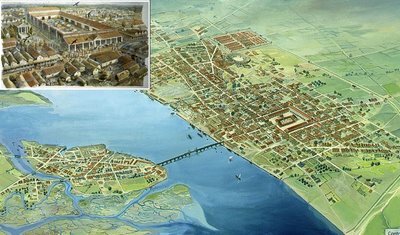 The Romans named it Londinium and it became a major trading center from the sea down the River and across land from the Dover Coast to the east. Remnants of the Roman wall around the city still exist juxtaposed with modern skyscrapers. The record of human habitation in London stretches back nearly 5,000 years BCE with the discovery of timber structures, spears and household implements, and the remains of Bronze Age bridge supports. It is difficult to imagine, looking out across the massive infrastructure of humanity that is London today, that in its earliest period, the area you stand in was heavily forested following the passage of the ice sheets of the last ice age. London of the twenty-first century is now in the top 25 largest cities in the world, and a vantage point high above the city reveals a prospect of fevered revitalization and building explosion. I counted 19 visible building cranes within an arc of 120 degrees in a 10-block area around our restaurant at the top of the National Portrait Gallery in central London. It is fascinating to see certain regions attract civilization over the millennia. 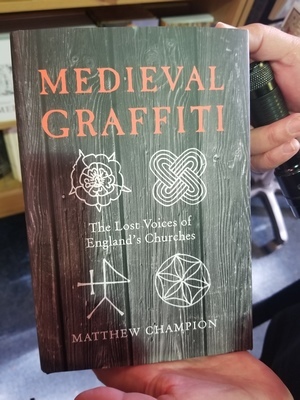 We visited a number of churches in London that have, in their crypts, archaeological digs revealing layer upon layer of previous human habitation, an open history book cut through layers of time. Very often one religious edifice is built above that of the previous eras: Roman above Druid shrines, Viking and Christian Norman above Roman, Medieval above Norman, followed by rebuilding after the numerous conflagrations that tore through London in the Medieval and into the Early Modern era. At the end of the last Ice Age, approximately 12-10,000 BCE, the continent of Europe and the island of Great Britain were joined in a land mass we now identify as Doggerland. Mesolithic and Neolithic nomads crossed this boggy, marshy, and lush region to colonize the newly emerging, ice free, and far-into-the-future region, known as England. Perhaps the closest resemblance to the long-told fable passed on through the ages—the Continent of Atlantis—may come closest to this now sunken continental shelf. A deluge of ocean due to two cataclysmic events: the bursting of the land dam that held back the massive Lake Agassiz in North America, left over from glaciation around 8,000 BCE; and a giant tsunami off the coast of Norway, the Storegga Slide, around 6200 BCE, created the existing North Sea and English Channel. These combined events raised the ocean levels well over 10 feet. Some say that the fable of the Great Flood may in some way be associated to these events. Several years prior to our journey to Britain, while tossing around ideas of where we might explore, we brainstormed the plan of making a secular walk along what once was an ancient Roman trackway from London to Canterbury. 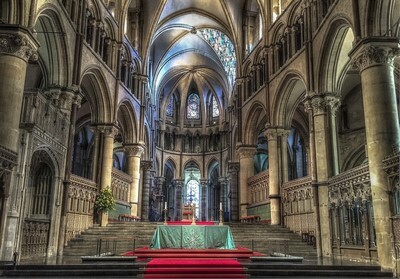 In the Christian Era, this was to became famous as the Pilgrims Way, as worshipers would trek to Canterbury to pay homage to the burial shrines of Archbishops St. Augustine, St. Anselm, and St. Thomas Becket, all known for their piety, and continue on across the English Channel to the heart of the Holy Roman Empire. About 60 years after the death of St. Anselm, Thomas Becket was chosen, reluctantly, as Archbishop but soon fell from the graces of King Henry II over the authority of the church and state. The royal/religious feuding escalated until the king may have said in passing, as interpreted by biographer Edward Grim, writing in Latin, “What miserable drones and traitors have I nourished and brought up in my household, who let their lord be treated with such shameful contempt by a low-born cleric?” Four knights, seeking the favor of their lord, set out to carry out the implied charge of King Henry. 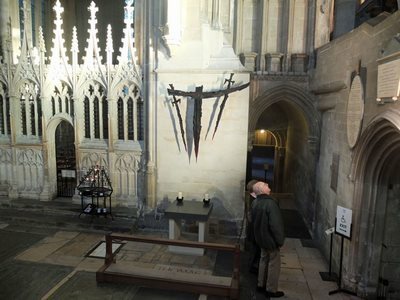 They confronted Archbishop Becket and demanded that he return with them to Winchester to account for his actions. He refused, and the knights set upon him with drawn swords, slicing the top from his skull and spreading his brains across the floor near the doors to the crypt. While preparing Becket’s body for burial, the monks discovered he was wearing a hairshirt, a sign of penance, and Becket soon became a martyr to the faithful throughout Europe. King Henry, seeing the public tide turn against him, also sought penance by publicly confessing his sins and having the newly elected bishops give him five blows each from a rod, along with each of the 80 monks of the Cathedral three blows each. Becket was sainted by the church and it wouldn’t be long before miracles were being attributed to him. Geoffrey Chaucer’s Canterbury Tales was set in a company of pilgrims setting out from Southwark to the shrine of St. Thomas in Canterbury. 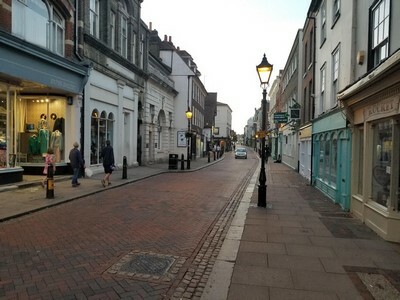 It is in this milieu that we decided to blend a wonderful historical cultural custom with an opportunity to exercise and see a portion of southeastern England. What better occasion to travel in time across the landscape at hiking speed? 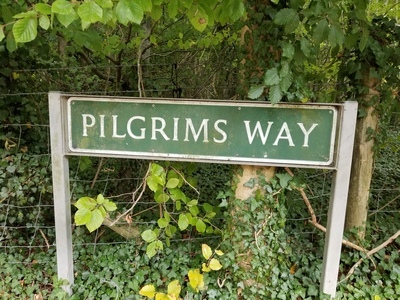 There is no single path that represents the Pilgrims Way, and modernity has made it more complex with the addition of the A2 Motorway and boring housing complexes over an early segment of the trackway. We chose to jump past this non-historical segment by walking from London to Greenwich, then taking a train to pick up the “true, more scenic” route in Rochester. 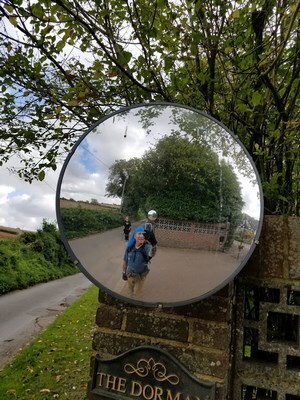 We averaged eight to fifteen miles each day, having sent our primary luggage on to Canterbury by courier, each of us carrying a small backpack with daily essentials. We made sleeping arrangements at local pubs and B&Bs along our path. We used GPS to guide us along a “trail” that evaporated and reappeared in small villages, across major motorways, up narrow and long winding hills and downs, and wended along and through farming fields. Trekking poles assisted us through five to eight hours of mostly continuous walking and soon became a moving meditation of rhythm. Twelfth-century pilgrims certainly didn’t have access nor consider how many miles, hours, and steps taken daily were employed in their wayfaring crusades, but thanks to twenty-first century GPS and Bluetooth-enabled fitness trackers, we can add another layer to our devotion to the cause. During our five-day trek, we traveled approximately 50 miles (about 18 initial miles by train to Rochester from Greenwich), in 25 hours, amassing over 110,000 leg-strengthening steps. There are some OCD exercise trackers that continuously push themselves to outperform their statistics and reach the “magical meaningless” number of 100,000 steps in a day. I wouldn’t call that a pilgrimage: you choose the appropriate word for this. At the end of each day we were extremely satisfied to drop our packs and poles and seek the balm of liquid refreshment at a local pub. The constant hiking pole/footstep cadence can be mesmerizing, though, and perhaps anesthetizing: step-pole, step-pole, step-pole. Or at a faster pace: step-step-pole, and so on. The mind processes the slowly passing landscape,walking cadence, and passing thoughts into a musical montage or mantra that changes time perception. The ancient Pilgrims Way trackway is cut deep into the earth in many locations from the millions of hooves, feet, and more modern bicycle tire incursions. In many sections the path transitions from open field into mysterious tunnels of hedgerows and trees that block out light. 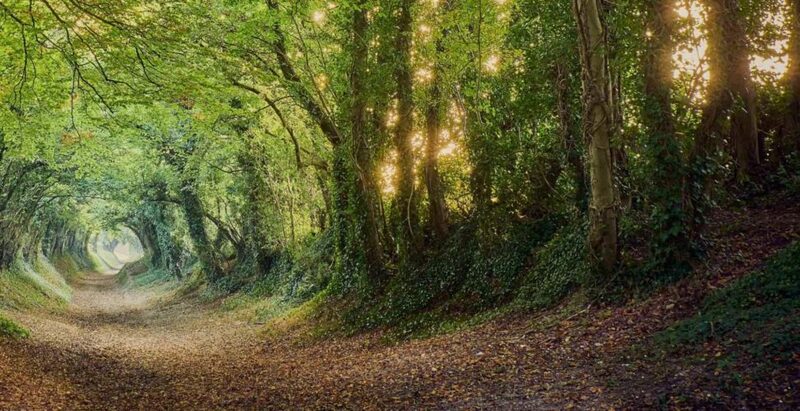 There were times when, looking ahead or behind, I imagined the specter of the Headless Horseman charging through the leaf-encompassed passageways. Often, after hours of hiking through hedgerows, we would come upon pubs tucked into the lush greenery around us. 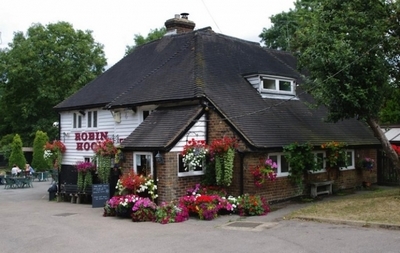 Our first was appropriately named the Robin Hood, and we were told that it opened its doors 700 years before and has been serving pilgrims ever since. Low-hanging ceiling joists displaying the marks of ancient hatchet scars and wavy flooring had long succumbed to the pull of time. This mirage caused us to pause and wonder who this pub continuously serves so far away from population . . . but in England just how far away is anything really? Gazing down at the ground is an activity that one must actively participate in for safety’s sake, and I slowly began to take a reckoning of objects and detritus seen along the pathways. The number one objects observed, I’m sorry to say, and in the most diverse locations, was McDonald’s cups and wrappers, followed by crisp (potato chip) bags. Incongruous, yes?! During our entire trek, we never spied another hiker on a similar quest. Where the Pilgrims Way merged into small navigable roadways to service small villages, we regularly saw broken off and smashed auto rear view mirrors. You can imagine two vehicles passing each other in the space of one, smashing off a mirror, and driving away without bothering to retrieve the damaged part. On the last day of our trek, we could see Canterbury Cathedral’s spires standing far above the town, a massive edifice exhibiting the technological—and architectural—culmination of its time. Every stone laid out with precision, hand cut, carved, and fitted geometrically and aesthetically by master craftsman who had the rare freedom to accumulate knowledge as they traveled throughout Europe. They acquired the arcane knowledge shared among the very few to build some of the most magnificent structures of a millennia. It’s quite impossible to stand within these breathtaking gems and not perceive a multi-dimensional time-traveling montage. 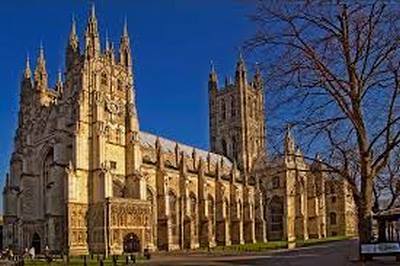 Canterbury Cathedral is one of the oldest Christian structures in England, construction beginning in 597 and continuing on and off until 1205, nearly 700 years of craftsmanship in stone and glass. Countless builders, worshipers, admirers, nobility, the internment of countless bodies within its proper proportions pass through your time-traveling imagination. History, and the development of civilization, amidst conflict and conciliation. 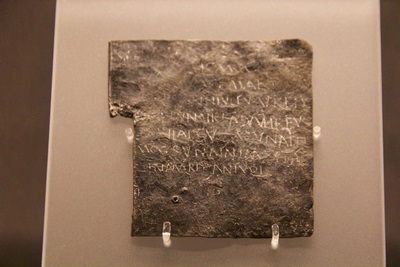 The Roman curse tablets from Bath Britain’s earliest prayers. These tablets are inscribed on the UNESCO Memory of the World register of significant documentary heritage. They are the only documents from Roman Britain on that list. 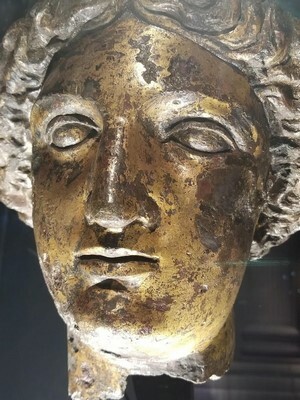 Complaint about theft of Vilbia – probably a woman. This curse includes a list of names of possible culprits. Perhaps Vilbia was a slave. 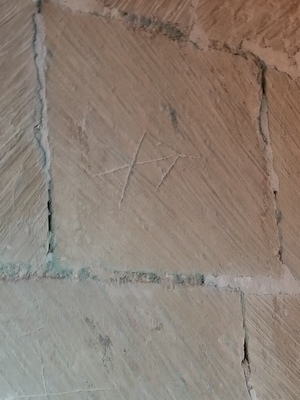 Our pilgrimage to and through Great Britain, and along the ancient trackway to Canterbury, represented for us an awakening to the wonders of human genius and evolution, permeating this island and clarifying the way forward by looking back in time. And yes, semper velox lumina (always carry a flashlight). Perhaps you have already ready how England’s road width impacted the US space program? As always, most groovy observations! Keep on truckin’. Thank you for enlightening to the value of horses asses!